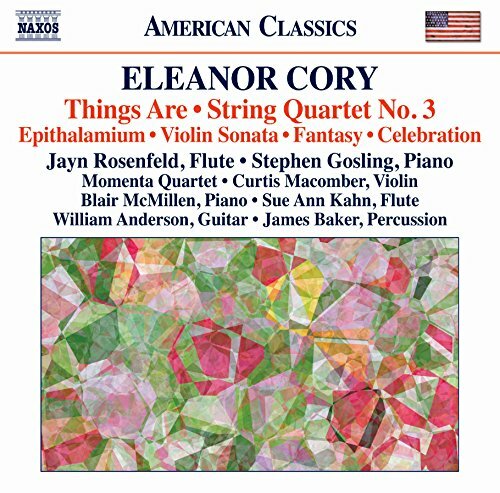 Eleanor Cory - New recording release on Naxos American Classics 8.559784 - String Quartet No. 3, Things Are (flute and piano), Epithalamium, Violin Sonata, Fantasy, and Celebration. Performers including Jayn Rosenfeld, Stephen Gosling, Curtis Macomber, Blair McMillen, Sue Ann Kahn, William Anderson, and James Baker, with the Momenta Quartet. Now available on Amazon.com and other vendors. Eleanor Cory's music is performed throughout the US and internationally and has been recognized by many awards and commissions including the Aaron Copland and Fromm Foundations and the National Endowment for the Arts. The shifting musical languages that give her compositions their unique vibrancy include the "modal, tonal, atonal mix" of her First Violin Sonata, as well as jazz elements. All of this and more can be found in Things Are, her memorial for composer Milton Babbitt, and in the Celebration of pianistic virtuosity. Cory's Third String Quartet expresses both "sweet melancholy" and playful dialogue. Epithalamium explores the flute's flexibility in elegantly shaped gestures, while the instrumentation of the Fantasy is light in its mood and airy textures.